Cut slices of orange, cucumber and strawberry, and arrange them round the inside of a bowl. Add mint leaves between the fruit. Place a smaller bowl inside and tape it down. Fill the space between with water and freeze until solid. Remove the tape and inside bowl, then release your ice bowl. Add strawberries frozen in ice cubes to the ice bowl. 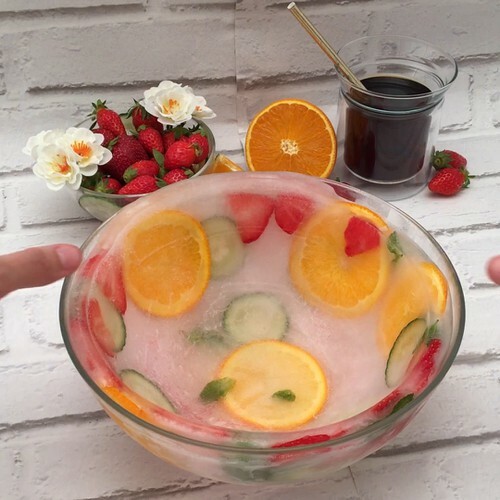 Pour the Pimms into the ice bowl, then add the lemonade with extra slices of cucumber and orange, and mint leaves. Add straws to the bowl and enjoy your Pimms bowl cocktail. Cheers!